I don't get into those online debates about whether the toilet paper should be over or under. But I do have a strong preference. Imagine my surprise when someone kept turning the toilet paper the other way in the bathroom. Each time, I would turn it around. I would come in later, and it would be the other way. Someone was definitely messing with me! I knew it wouldn't be Paul. He's not the sort of person who takes any notice of things like the direction of toilet paper. Which left one of the boys. Eventually, Reid 'fessed up. I was so surprised it was him! He told me that I kept putting the toilet paper on wrong. ME!? I tried to tell him that no, the toilet paper was supposed to go the other way. He argued. He continued to turn the toilet paper around on me. Do you think there is an over/under gene? He's only five. Yet he seems to have been born with a toilet paper preference. A strong preference for the roll being over. If only his preference, and my preference, matched up! I suppose it depends on what kind of holder but usually 'over' is easier for people to reach. Smart boy! Now go get a nap! Ann Landers shared the argument for years. Does it matter, when there is none available? I don't care which easy it hangs anymore. I'm just grateful to have it! First, your son will be a dream hubby for sure- and I agree, I'm and over TP girl too! I had to laugh about your hubby, because mine is the same way- just be sure it's there, even if it's not even hanging yet! So happy you solved your mystery quickly too, because I'd be gonna nuts too! I don't care for these things! i'm totally an 'over' person. you're wrong. I am an over. The only right way. You may have to give on on this one - to avoid permanent scars. Lol. Focus on the folding of the bath towels. What a cute picture! You GO, Reid!! Yes, I am like Reid. All my life I can only use it if it is over. I don't like it to touch the wall while I am unrolling, and somehow feel it is cleaner this way. Now you will have to install another holder so there are TWO. Whether you tell Reid this or not (fuel for his argument) will be up to you! You know, I never thought about it. I'd have to go look to see how it is set up. I guess the main thing is to have some toilet paper! I go with over, too. 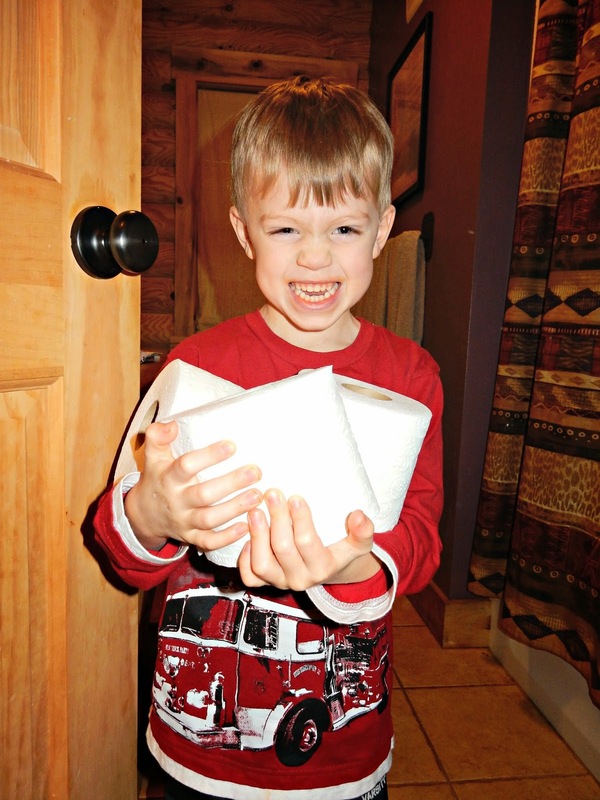 Try this experiment that was explained to me by some fussbudget years ago: Let a little kid give a SLIGHT tug on the toilet paper in both positions. The over position usually only unrolls the length of their arm, and the under position usually spins and travels for a very long way. We like it over tooo.. It doesn't bother me. When I had a puppy, I had it come out from under because it was less tempting for him to pull it and run! Fortunately, everybody in our house agrees as to the direction. And they are pretty good at replacing it, so no battles here! Thank goodness. That's pretty funny that he was changing it on you! That's too funny that he was the one that was doing it! I like it over I guess. I'm not too particular. I just think it's easier to roll that way. Plus my first real job was working in a hotel. I had to do the fold triangle thing. It won't stay the other way. I'm going to have to agree with Reid on this one!